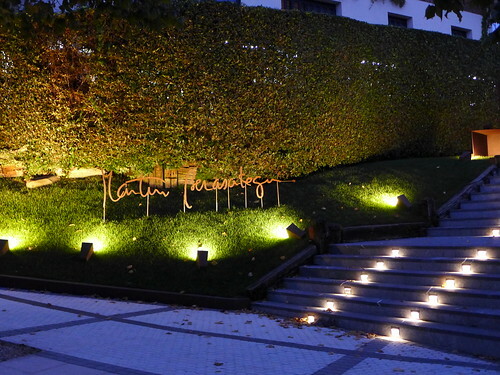 Martin Berasategui probably isn’t the most talked-about Spanish chef these days. 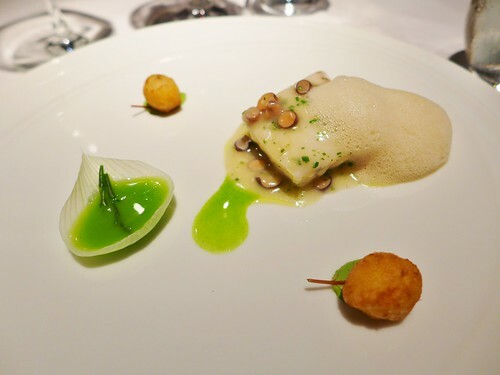 His track-record though puts him as one of the institutions of Spanish fine-dining, as his restaurant is holding a Michelin star for 25 years now and entered the elite circle of 3 star restaurants in 2001, 13 years ago. So what was I expecting? 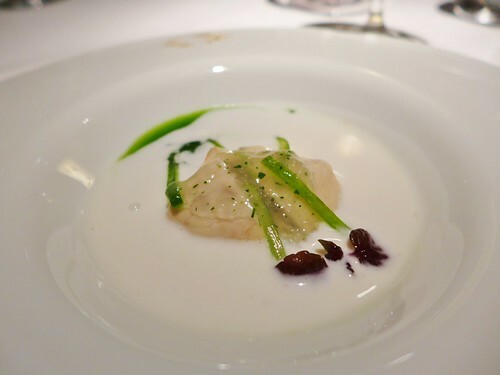 Without having read much about him, not even blog reviews, I was rather awaiting some kind of classical Spanish fine dining, product-centered with flavor-combinations that have already proved successful and very few modern twists. Maybe something like the Spanish Troisgros or Bocuse. However, I was about to find out that my expectations weren’t quite right. 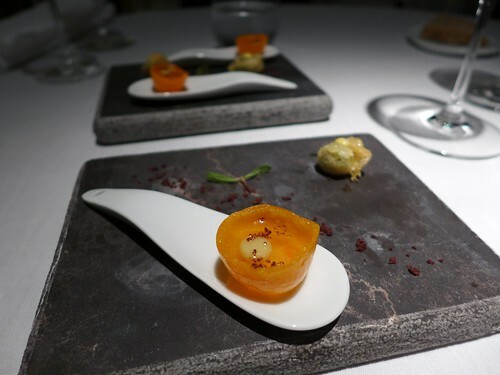 Although quality and choice of products clearly play an important role in his cuisine, Berasategui is even more focusing on creativity and flavor combination. And some of these were to leave us breathless and with dropped jaws. A chef and a restaurant full of surprises! First things that surprise us, as we are starting our meal, there are no extra amuses than the ones stated on the printout menu. Something quite unusual for a restaurant at 3 star level. I think I’ve actually never seen it before. Another interesting observation: the served bread (among the bread choices is an excellent focaccia by the way) doesn’t come with butter. This doesn’t really bother me but we are seeing tables asking for some. So these 2 details maybe signal that Berasategui is not someone who necessarily follows conventions. So the menu starts with the 2 amuses: 2014 sea crunch tempura with txakoli wine mayonnaise and citrus gel as well as 2014 kumquat, potato firewater, olive and anchovy. We are asked to start with the tempura as it is served warm: it has a smeary and lemony aspect, maybe isn’t cooked all the way through. The kumquat with aquavit appears bitter and fresh at the same time but represents nothing to really get excited about. We all agreed that this was a weak start. A while later though we were suspecting that this weak start was planned, so that the kitchen could improve linearly or even exponentially with each of the following dishes. 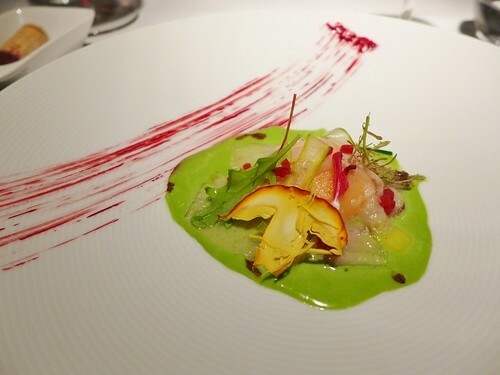 The third dish is at the same time the first starter and already appears to be a small masterpiece. 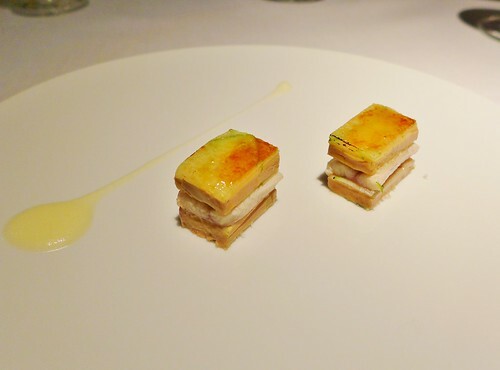 1995 mille-feuille of smoked eel, foie gras, spring onions and green apple are 2 bites mainly composed of eel, foie gras and green apple that are put together with unbelievable delicacy. Albeit being crunchy the slices of green apple and spring onion are so thin that the mille feuille doesn’t at all seem rustic. What elegance! Then the apple gives the acidity needed to counterbalance the richness of the foie and the eel which by the way are both of superb quality. It is also nice to see that, although the used ingredients are quite rich, there is no overpowering. The whole bite is subtle enough that the hint of smoke coming from the eel pronounces itself impeccably. 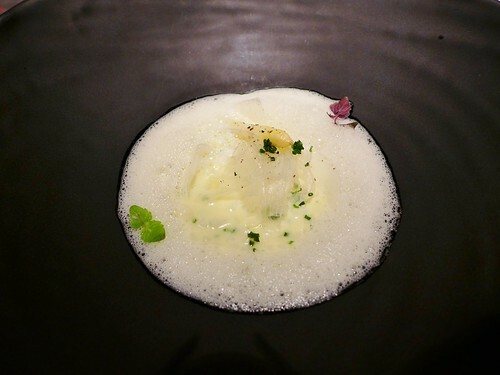 Plus, it is also mirrored in a foam of Parmesan cheese which has been drizzled on the side of the plate. How much detail, harmony and flavor can one put in two bites? Excellent! 2014 red shrimp royale and dill with “venta del baron” oil works to perfection as well. The announced dill is so light, fresh and elegant, it could be fennel or another fine herb. The creamy sauce on the bottom of the plate, allegedly being a crustacean reduction shows such a compelling richness, that I suspect it to be enhanced with sea urchin roe. But maybe this is just the effect of the venta del baron olive oil. The warm royale also contains delicious bits of tender and juicy shrimp. Again, it is very interesting to observe how well the levels of richness are controlled. Good! 2011 oyster with cucumber, kafir and coconut. A genius dish! Ingredients that I’ve never seen together on a plate create such an exciting and harmonious combination. There are fresh green notes of a watercress emulsion (I think the waiter called it “liquid chlorophyll”) and cucumber that inexplicably function so well with the oyster. The latter, cut in two bits, has nice sweet flesh that also finds a response in the not too intense, rather fresh coconut aroma. The fresh and sweet tastes of the ocean are married to the fresh and sweet notes of ingredients growing on earth. The flavors of all these ingredients are bold in theory, but here they are all kept mild and subtle. For example, the exotic flavors of coconut and kafir lime leaves never seem over-pronounced. And if one might think that there are only that many was to prepare oyster, he has to try this and think again. This is greatness on a plate. 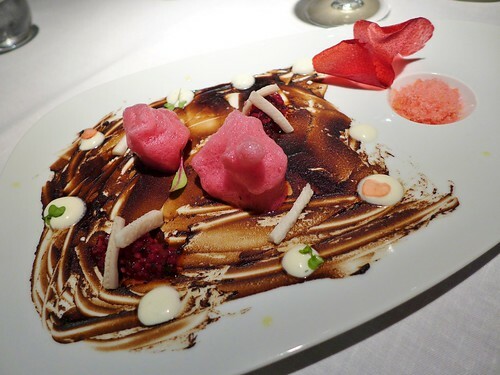 2013 sauteed black garlic with beet ceviche, ice radish and raifort cream. Again an incredible dish. The brunoise of red beet and fermented garlic, which is marinated with some type of vinegar or maybe even lime (should be called ceviche for a reason, right?) is one of the stars on the plate. It adds flavor, acidity and excitement to all other elements of the dish. To summarize the clever and tasty flavor profile of the plate: the earthiness of the red beet is being linked to the earth notes of the black garlic and the smoke tones of the tender eel bits. Some horseradish cream and ice cream add more accents of flavor (spice!) and freshness. Again, excellent! 2014 raw seaweed and seaweed cram on “sea urchin curd” with fennel salad. This one is, in my opinion, a much weaker dish, although I suspect it has been composed that way with the purpose of having a gentle and refreshing interlude. The thin shavings of fennel add an unusual watery crunch which might serve to balance out the richness of the sea urchin cream. Somehow this feel doesn’t appeal to me. The seaweeds then add nothing more than texture. Regarding the sea urchin curd, our Californian friend on the table thought that this sea urchin had a little harshness and wasn’t as fresh and smooth as the high-end sea urchin roe he is used to get in California. I personally didn’t recognize any harshness. But still I am not really fond of this dish. 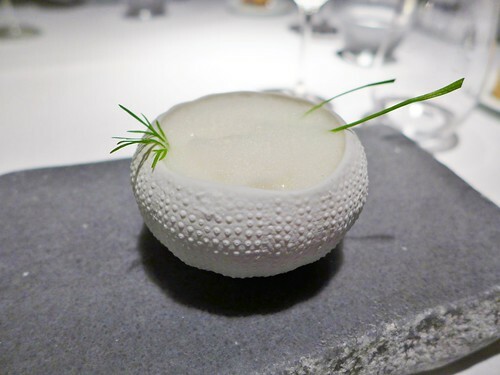 2014 raw asparagus stalks blended with “idiazabal” whey and hints of anis seed. It takes something to bring a classic and simple dish as asparagus with “hollandaise sauce” to this level. The big difference though is that the classical hollandaise has been replaced with an infusion of idiazabal cheese. Inside this elegant and refined cream sauce I find small pieces of white asparagus and on top shavings of (peeled) raw asparagus that add texture and flavor depth at the same time. The anise in the sauce only brings in a slight touch of freshness that elevated the whole dish (I wouldn’t have thought that asparagus could work with anise, but it does). This is an excellent dish. Plate-licking good! 2011 “gorrotxategi” egg resting on a herb liquid salad and dewlap carpaccio. What tastes like the fat part of a fine Spanish ham is actually a carpaccio of dewlap of that same animal. It is bringing a subtle aroma to that liquid egg yolk. But somehow, when mixing all ingredients as advised by the waiter you don’t get much taste of that liquid herb salad underneath. Not too exciting in my opinion, but still quite nice. 2001 vegetable hearts salad with seafood, cream of lettuce and iodized juice. This one is like heaven. On the bottom of this large plate we find an amazingly fresh jelly with the taste of tomato essence. This is so good, I could eat it alone. 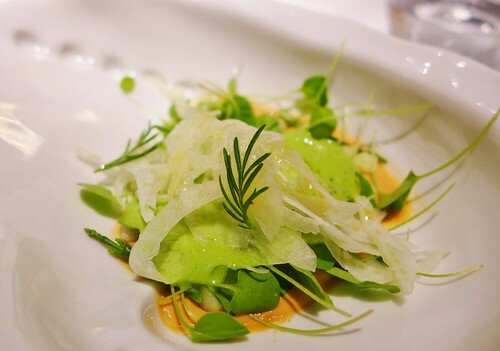 But there’s much more: the freshness of celeriac, the mild spice of cilantro, there’s soft avocado and crunchy bits of macadamia nut as well as the gentle nut aromas of green asparagus. Tender and flavorful bits of lobster fit perfectly into this potpourri, adding an umami flavor that is somehow reflected in the tomato essence jelly. 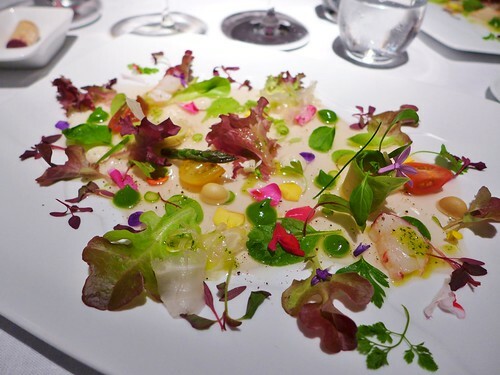 And of course there are plenty of different salad leafs, flowers and herbs on the plate that not only add color, but also complexity. The combination of all ingredients of this beautiful landscape on a plate created a balanced experience of flavor and freshness with each spoonful. This is an amazing! 2014 roasted pigeon served with its juices mixed with dead olives, liquid tubers stuffed with truffles and cucumber pickled in white vinegar and curry. The piece of pigeon (from Navarra, as was Azurmendi’s) is flavorful and tender. I really like the contrast with the brunoise of acidic cucumber which is hidden under the bird: it has only the slightest hint of curry. But the truly amazing addition on this dish are 2 small tubes made of topinambour and filled with an intense truffle broth. 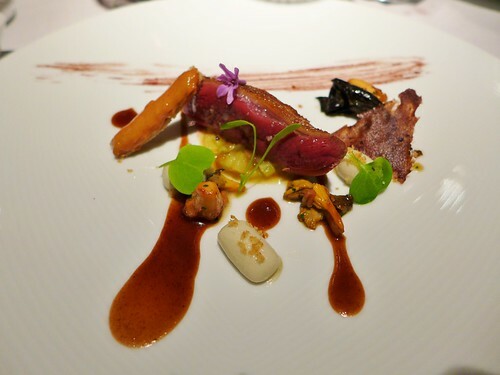 Pigeon meat and then truffle flavor exploding in your mouth – hard to beat that! This is how you put dynamics into a classic dish. It is for sure on of the best pigeon dishes I had (Others are Sang Hoon Degeimbre’s and Dennis Maier’s take on Amador’s pigeon with purple curry crust at Sra Bua in Frankfurt). 2014 gin tonic with mint over cucumber, lemon and apple popcorn. The first dessert again is a landscape on a plate. This time a landscape of lemony freshness. There are mild and flavorful cubes of melon meeting the acidity of apples and the freshness of tonic water ice. Great! 2014 smoked sponge with cocoa crunch, frozen whisky cream, crushed ice, green beans and mint. The pre-dessert was nice, but this one tops it! There’s a delicious light, creamy and fresh sponge cake with bits of crunchy cocoa inside. It has the slightest smoke aroma which builds a link to the rich, intense and smoky whisky ice cream. The ice shavings next to the ice cream are also flavored with whisky and add that kind of refreshing taste that whisky on the rocks might have compared to a whisky cream such as Bailey’s. Then, the mother of all genius ideas: adding some thinly chopped crunchy green beans. This particular taste isn’t too far away from the whisky notes, but at the same time also build a bridge to the light mint tones that seem to be present as a general layer atop all ingredients. There’s great interactivity and harmony with all components here. What an excellent dessert. One of the best I ever had. This meal was outstanding! While on one hand it is a little amusing that Berasategui literally promotes himself as an institution of Spanish fine dining by adding the year of creation to each of his dishes on the menu. On the other hand it shows that he has come up with modern and creative combination that are truly set to be timeless. 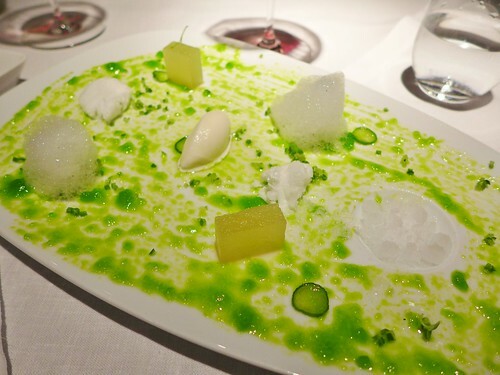 A 2001 vegetable hearts salad ist still breathtaking now and probably will be in 10 more years. So albeit being around with his restaurant for over 25 years now, there’s nothing old-fashioned or classical (in a French kind of way) about his cooking style. 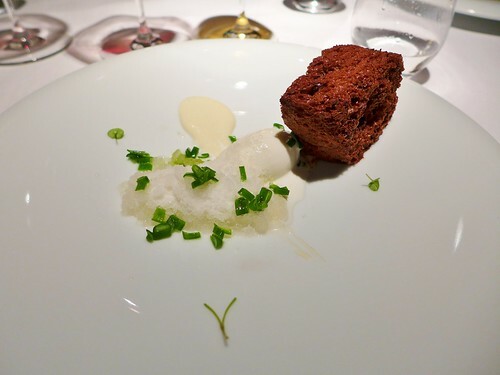 Combining Beetroot with black garlic, oyster with coconut, and (kudos to the pastry chef, by the way – that was one of the best series of desserts I had), chocolate with mint, whiskey and green beans, are a proof of genuine modernism. This is definitely worth a trip!